Stop searching. 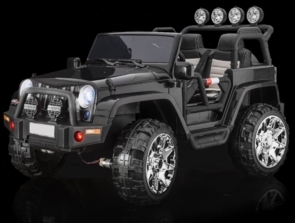 You have found the BIGGEST CLASS 2 seater battery powered ride on Jeep style trucks make for amazing fun inside or outside of the house and is a true 4 x 4 with 4 motors for plenty of power on grass, dirt, pavement, and even light snow! Measures 5 feet long and over 3 feet wide. Most cars on the market and traditional ride on vehicles at Toys R Us have (1) 6 volt motor and (1) 6 volt battery pack which is not enough power. Not your new truck so buy today and you will receive the Playtime Power Pack 24 volt battery upgrade made of 2 combined 12 volt battery packs which will give you continuous run times of 2-3 hours!This awesome battery powered ride on toy is great for 2 kids or 1 large child such as a 10 year old and holds up to 133 pounds. We have seen adults ride on this as well. Features include the playtime power pack battery upgrade, rubber wheels with tread, working lights, real suspension, real painted body, 3 selectable forward speeds, and reverse. Choose from black, white, or red. Start cruising your house or block in style with this awesome battery powered ride on toy. Want more? Magic Cars® are the best ride on cars. It's like owning 2 cars in 1 as you can allow children to drive the electric car themselves from inside the car with the steering wheel, pedals, and buttons. Or control your new 4 x 4 SUV truck via the included wireless Magic Cars® steering wheel to operate in Mom/Dad mode. Live the good life with the Magic Cars®2 Seater Jeep Style Truck 4x4 SUV class 4 wheel drive ride on car for kids with leather seats, working stereo, Mp3/USB inputs, working headlights, working taillights, Magic Cars® wireless parental control, real rubber tires, real opening driver/passenger doors, chrome exhaust, 4x4 wheel drive, (4) 12 volt motors for plenty of power! That's right, 1 motor for each wheel to power through mud, grass, rocks, and over the pavement to Grandma's house we go! Plus, if you order today you will receive the power pack upgrade of (2) 12 volt battery packs for run times of 2-3 hours. Holds 2 children with 2 seats for double the fun. Measures a whopping 5 feet long, over 3 feet wide, and will handle up to 133 pounds. Perfect for ages 1-10 and will last for years. Perhaps you drive a full size 4 x 4 Jeep truck so you know that this ride on car is perfect for children and everyday use. Magic Cars® are the best ride on cars. It's like owning 2 cars in 1 as you can allow children to drive the electric car themselves from inside the car with the steering wheel, pedals, and buttons. Or control your new 4 x 4 SUV truck via the included wireless Magic Cars® steering wheel to operate in Mom/Dad mode. All spare parts are available just in case like a full size truck! This superior crafted electric powered vehicle has won multiple awards and established itself as one of the best toys on the market. Ideal for children ages one and up, thousands have been sold worldwide, making it one of the best selling toy car in the world. The huge and lasting popularity of this car has much to do with the large steering wheel, comfortable seats, and wheel motion that is smooth and efficient. The combination of these phenomenal features makes a product that is truly unique and worth every penny that you spend. Kids will feel like grown-ups as they drive around the neighborhood. Comes with dual 12 volt motor system and 12 volt rechargeable battery pack to provide plenty of traction over grass, street, dirt, rocks, and more. Highly durable and capable of supporting a load of up to 130 pounds, this truck arrives almost fully assembled in an extremely large box and will be a phenomenal addition to your toy collection. Watch the official Trend Times Magic Cars® remote control ride on RC car commercial below and enjoy what is so amazing today. Don't be fooled by imitators, only official Magic Cars® sold on TrendTimes.com come with the "Best In Class" 1 year bumper to bumper warranty for free. New and improved with bluetooth remote control! Buy from TrendTimes.com, your #1 4 x 4 ride on toy experts. Plus, you can tell your child, "Hey, be nice, I bought you a an amazing 4 x 4 truck for your first car". Now parents can press the "STOP" button on the remote control which stops the car from driving. The speed level is now ON the remote itself, so parents control the speed (3 speed options) at will. Comes with 1 year bumper to bumper warranty and we carry all spare parts just in case you need something in the future just like your full size truck! Length: 60", Width: 39", Height: 33"
Weight Capacity of 133 Lbs.